An American success story if there every was one. That's only one side of it, though. In some corners of the internet (including this blog), there is a feeling that Bell has not found his success in a legitimate way. This is the ninth post in a series detailing the reasoning behind that particular feeling. If you'd like to start at the beginning, it's here. In the world of sports, people tend to ascribe a lot of importance to what "Vegas" says. And in a lot of cases, there's good reason for that. Particularly when you're dealing with mature markets in major sports with high limits, the current Vegas line is not something to scoff it, as it gives you a pretty good indication of how the two teams stack up. Dave Malinsky was hired by Pregame a couple weeks ago. I guess "Vegas" sounds better than "A guy who's lived in Vegas since 1988 yet in 2014 is working for my scam tout site". Beyond the ridiculous presentation of the information, the actual content was terrible as well. 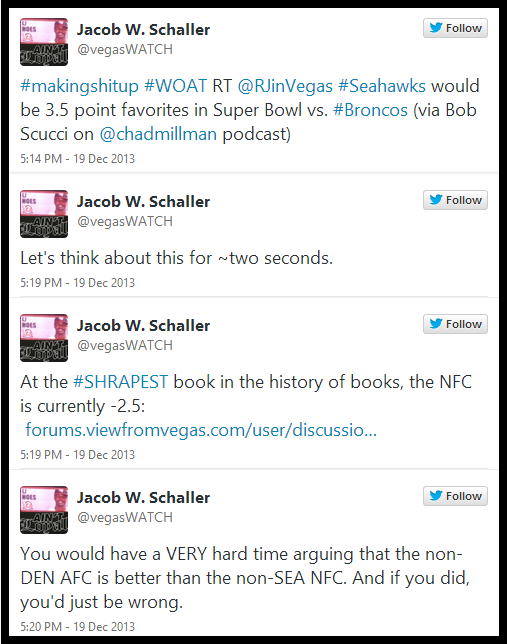 At the time Bell posted that "analysis", one of the largest actual Vegas books, Cantor, was dealing Rams -4 (the market had been at -6 before the Bradford news). And then Monday afternoon, LVH announced that they'd moved their line from -6 pre-injury to -3.5. Quite a bit different from "1 point per game AT MOST". No comment from Bell on that though; he'd already gotten his shock value RTs and page views, and wouldn't want to make his source(/employee) look silly. The subtle con here is in the phrasing. First make a confident statement about the prospective Seahawks-Broncos line, then parenthetically mention that you heard it on Chad Flipping Millman's podcast. Thus, the LVH Super Bowl line implied that the SEA-DEN line would, if anything, be shorter than SEA -2.5. And certainly not SEA -3.5, which is wildly different from even just -2.5 due to the substantial value of 3. No attempt is being made here to inform anyone about anything; Bell is ignoring directly relevant information in favor of providing the most eye-popping tidbit he can find, in order to garner as much attention as possible. Sound familiar? Oakland's blockbuster trade didn't help their World Series chances at all? I mean that doesn't really make any sense, but it sure is a hot take! I thought Vegas graded the trade as having no effect? Now, even after the Tigers acquired Price, the Athletics' WS chances have improved by over 20%? We're kind of all over the map here. It's almost like you're using "Vegas" as a meaningless buzzword to attribute an undeserving level of importance to the information you're tweeting! Fezzik is wrong about a lot of things, but not this. Bell quotes oddsmakers, and tweets about how "Vegas grades the trade" because he knows that'll get people's attention. But, similar to "World Openers", that approach is just preying on the public's lack of understanding of how betting markets actually work. You can quote a sportsbook employee about a prospective line, or the value of HFA, or whatever. But as we've seen, that information is anything but reliable, and often wildly inaccurate. 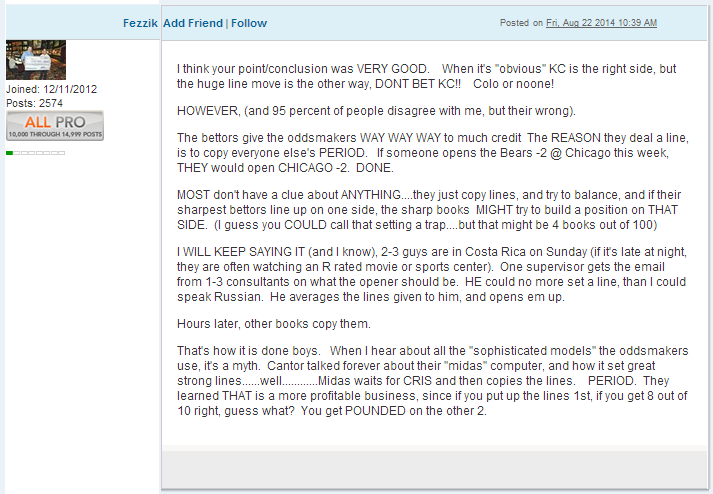 As Fezzik says above, the fact is that the overwhelming majority of sportsbook employees don't originate anything. Rather, they just copy the lines posted elsewhere, and then move them based on the action they take and/or line movement elsewhere. And even for the folks who post unique lines, there's a reason that they open the markets with relatively low limits; the oddsmakers are well aware that there are guys out there that are better at handicapping than they are, and the lines will get bet into shape as the limits increase. And that is where "Vegas says" is actually interesting, when you see how a line moves from open to close, or even just where it ends up after the market has matured. Which is quite different than asking sportsbook employees to come up with fantasy lines for made up QB swaps, or non-existent rematches. The entire point of attributing info to "Vegas" -- that there's a lot of money behind these opinions -- is entirely absent when you're quoting $250 openers, fresh futures markets, or prospective lines. But you can still make the info sound important and get some retweets, which is all Bell cares about, so that's what he does. Next Long Con post: Is This Earth? This was easily my favorite post of the series. The reason for that is this concept of "illusion of Insider access" that RJ is just masterful at portraying. When I take a second to put my personal RJ experiences aside, you have to wonder how someone who has no success handicapping sports, no understanding of betting markets and no real math skills has become this "voice" of the gambling world. RJ has seemingly made himself "an Insider" without actually being an insider to anything other than having media outlet access, which of course, is a result of the long con he's playing. Which all begs the question - can anyone point to some specific event other than Twitter "success" for RJ's immersion into the gambling media world / some event that gave RJ "authority" on sports gambling? The initial answer that comes to mind is the Donaghy scandal. http://pregame.com/pregame_blogs/b/rj-bell/archive/2008/05/17/nba-referee-tim-donaghy-strong-evidence-of-game-fixing.aspx - This does indeed seem to be the tipping point for the rise in his exposure and of course it's RJ Bell acting as if he has "inside" evidence of game fixing when in reality he's just relaying a third party's information. And even then, what's posted seems ridiculous. "Over 50 BILLION dollars are bet on NBA each season" - For the 2013/14 season, looking at the Vegas casino financial reports, I'd be amazed if the handle approached half a billion. 6 years ago, I'd highly doubt that with overseas and offshore online books accounted for $49 billion dollars bet on the NBA (not even including college). I mean even 6 years ago Bell is just #makingstuffup and acting as some type of insider. 50 Billion though. "Sports gambling expert R. J. Bell, president of sports betting information site Pregame.com, tracked every game Donaghy worked from 2003 to 2007. He discovered that during the two seasons investigated by the NBA, the teams involved scored more points than expected by the Las Vegas sports books 57 percent of the time. In the previous two seasons, this only happened 44 percent of the time. According to Bell, the odds of such a discrepancy are 1 in 1,000, and there was "a 99.9 percent chance that these results would not have happened without an outside factor"." Simply amazing how this one news event, that he didn't even report correctly, made him famous. America yo. Yeah, the Donaghy scandal was where I first heard of RJ. After the scandal broke, RJ issued a press release about how "an eye-popping X% of Donaghy reffed games fell with a basket of the line." That press release got posted on some gambling forums, including the old Fezziksplace forum, where I saw it. X% was almost exactly what we'd expect from random luck, and I posted as such on Fezziksplace. RJ replied that "I never said the number was unusual, just that it's interesting." Um, ok.
Next he claimed that he had a list of Donaghy reffed games with large line movement where the side that was bet won every time. When posters said, that could be interesting, where's the list, RJ said "My lawyers have advised me not to publish the list of games" -- his usual "hiding behind the lawyers" excuse. I can't imagine what possible consequences there could be to publishing a list of games that moved more than X points. Given that RJ isn't even competent enough to accurately report current lines, I'm morally certain that list never existed. RJ ducked out of the conversation with his usual "people with agendas" excuse, and went back to his own censored forum, where he deleted posts critical of his analysis. Everything RJ said was after the scandal broke, but I've seen countless media outlets report that "RJ Bell is famous for discovering the Tim Donaghy scandal and bringing it to the NBA's attention," and of course RJ doesn't correct them. His press releases on that matter were his usual combination of exaggeration, half-truths, and complete fiction, and media outlets uninformed about gambling ate it up. The Long Con of @RJinVegas: "Transparency"